Great design, positivity and inclusion. 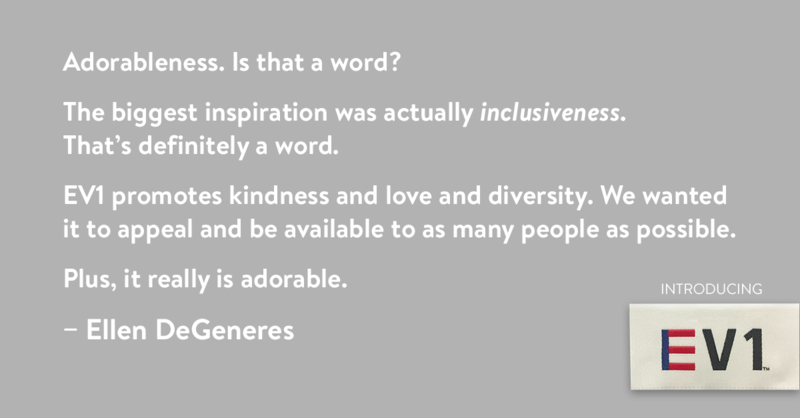 That’s the inspiration behind our new fashion brand with comedian, TV personality and style-icon, Ellen DeGeneres. I’m thrilled to announce that we are working with Ellen to introduce EV1, a new women’s line that will debut this September and will feature nearly 60 items, ranging from denim and tees to accessories and footwear. The core of the EV1 collection is denim – an iconic American staple. We, along with Ellen, wanted to make a line that worked for everyone (EV1). Designed to be effortlessly stylish, EV1 was inspired by Ellen’s own confidence and optimism (think tees with inspirational sayings, elevated denim and, of course, fantastic sneakers). It’s cool, fun and accessible. All launch items are priced at $30 or less and are designed to be mixed and matched. The line will also offer a wide range of sizes. This year, we’ve been hard at work transforming the fashion experience on Walmart.com – from launching a new specialty shopping experience that helps customers browse and discover our assortment, to introducing our Premium Brands shop with Lord & Taylor. With the foundation now laid, we’re excited to focus on broadening our fashion assortment. The launch of EV1 is one of many steps we’re taking to establish Walmart.com as a fashion destination, and I can’t wait for you to check it out. By Denise Incandela, Head of Fashion, Walmart eCommerce U.S.